The main goal of root canal therapy is thorough mechanical and chemical cleansing of the entire pulp space and its three-dimensional obturation. Therefore, a conscientious knowledge of the presence of unusual root canal morphology is crucial for successful root canal treatment. Failure to locate and fill a root canal can lead to posttreatment complications. It is a well-known fact that failure to negotiate all the canals may contribute to an unsuccessful endodontic treatment. It is an endodontic challenge to diagnose and treat extra root canals; however, the inability to find and properly treat the canals may cause failure. Atypical root canal anatomy related with the mandibular first molar has been documented in various studies. In 2013, Witherspoon et al. showed a higher range of missed canals in distal root as compared to that in the mesial root, which was 86% and 14%, respectively. The occurrence of three mesial canals was 13.3%, four mesial canals was 3.3%, and three distal canals was 1.7% as documented in a radiographic study of extracted mandibular first molars. First occurrence of three distal canals in mandibular first molar was reported by Stroner et al. in 1984. The occurrence of five canals ranges from 1% to 15% and the occurrence of three distal canals is 0.6% in mandibular first molars. But with the advent of magnification such as surgical loupes aberrant root canal anatomy can be successfully dealt. This case report depicts the successful endodontic management of mandibular first molar with atypical root canal anatomy, showing the presence of three distal canals with the aid of surgical loupes. 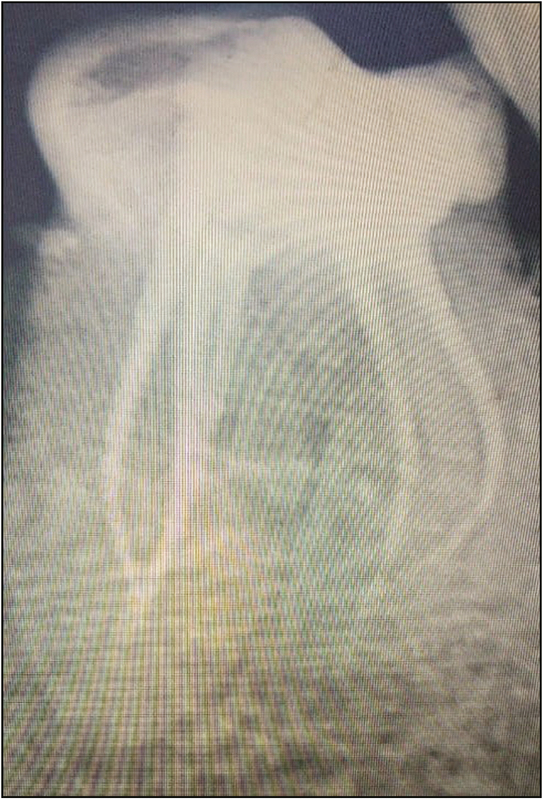 A 65-year-old patient was referred to the Department of Conservative Dentistry and Endodontics, PDM Dental College and Research Institute, Jhajjar, Haryana, India, with a chief complaint of pain in the right lower back tooth region. On examination, a faulty restoration was found to be present in the right mandibular first molar (tooth 46), which was tender on percussion. Patient’s medical history was noncontributory. The tooth was not mobile and periodontal probing was within physiologic limits. The preoperative radiograph revealed restoration encroaching the pulp space with periodontal widening in relation to the mesial root apex. 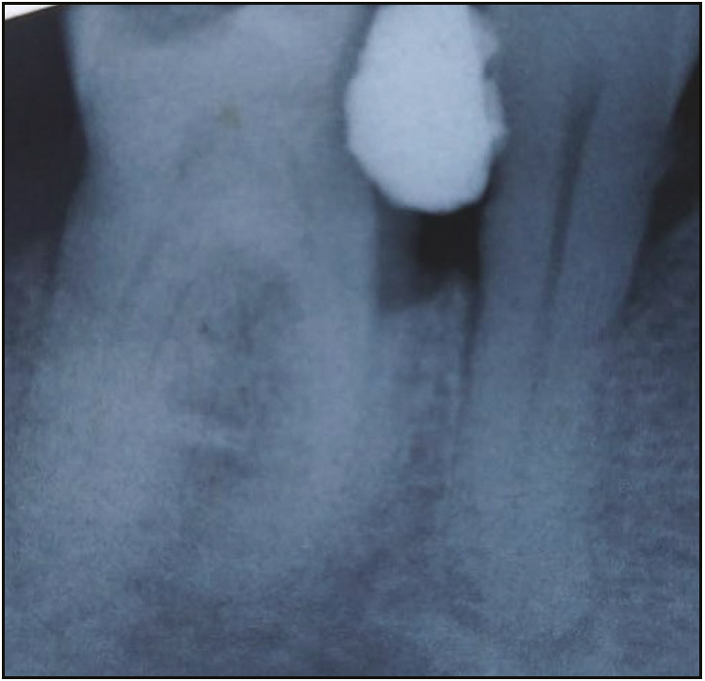 From the clinical and radiographic findings, a diagnosis of symptomatic irreversible pulpitis with symptomatic apical periodontitis was made for tooth 46 and root canal treatment was scheduled. Radiographic evaluation of the tooth indicated a normal root canal anatomy [Figure 1]. Right inferior alveolar nerve block was administered with 2% lignocaine containing 1:200,000 epinephrine (LOX, Neon laboratories limited, Mumbai, India), an endodontic access cavity was prepared under rubber dam isolation on tooth 46. On examination with a DG-16 endodontic explorer (Hu-Friedy, Chicago, Illinois), the pulp chamber was found to have four canals (mesiobuccal, mesiolingual, distobuccal, and distolingual). 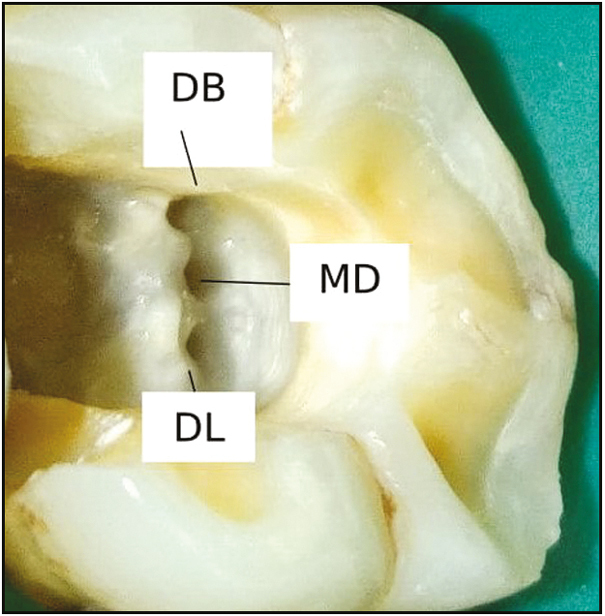 On inspection under surgical loupes, a third canal was located in the distal root between the previously identified distolingual (DL) and distobuccal (DB) canals, that is, middle distal (MD) canal [Figure 2]. The conventional triangular access cavity was modified into a more trapezoidal cavity to obtain straight-line access to all the five canals. 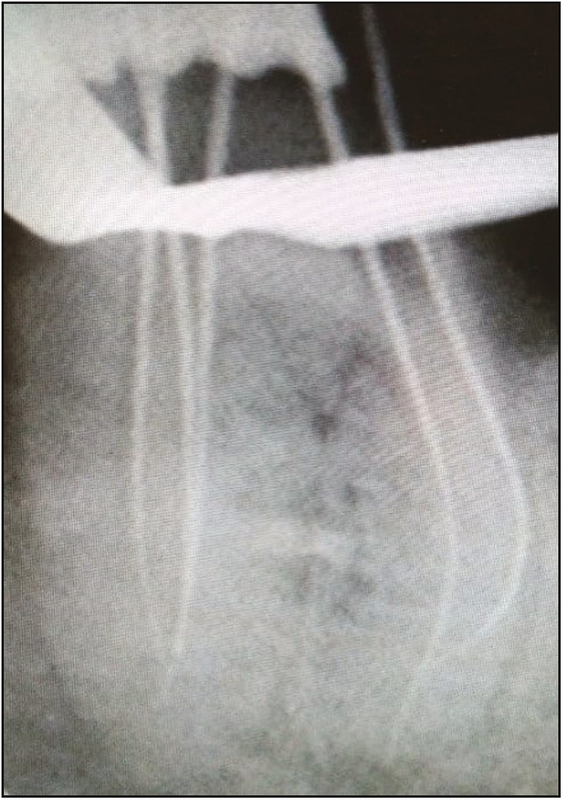 After scouting the root canals, flaring of the coronal thirds was performed with a GG drill (Mani,Tochigi, Japan). The working length was determined using an electronic apex locator (DentaPort; J. Morita, Kyoto, Japan) and confirmed radiographically [Figure 3]. The root canals were prepared in a crown-down method using Hero Shaper rotary instrumentation Hero shaper (Micro Mega, Sandton, South Africa). Irrigation between each instrument was performed using saline, 3% sodium hypochlorite, and 17% ethylenediaminetetraacetic acid (Prime Dental Product, Mumbai, India). The canals were dried with absorbent points (Dentsply, USA), and an intracanal dressing with calcium hydroxide paste was placed into the root canals using a Lentulospiral (Dentsply Maillefer, Ballaigues, Switzerland). The access cavity was sealed temporarily with a cotton pellet and Cavit (3M ESPE, Seefeld, Germany). At the next appointment, 1 week later, the tooth was asymptomatic. The calcium hydroxide paste was removed with ultrasonic instrumentation, and a final irrigation was performed with 3% hypochlorite. The canals were dried with Absorbent points (Dentsply Tulsa, Tulsa, OK, USA) and filled using cold lateral compaction of gutta-percha and Sealapex sealer (Kerr, Orange, CA, USA). The tooth was then restored with a posterior composite resin core. A postoperative radiograph [Figure 4] was taken, and the patient was asymptomatic during the follow-up period. Complete knowledge of the normal root canal anatomy and aberrations is essential for the clinician. Understanding of the root canal morphology is vital to minimize the risk of endodontic failure. Dentinal map on the floor of the pulp chamber aids in the detection of additional canals. Oval orifices, that is, mesiodistally or buccolingually, depict the probability of additional canal as seen in this case, where buccolingually wider distolingual orifice showed the presence of two canals. The use of magnification (loupes and dental-operating microscopes) is helpful in diagnosing additional canals. Aberrations in the root canal occur frequently and it is essential that the dentist identifies and manages them. Mandibular first molar predominantly has two roots, one mesial and one distal, and two root canals in the mesial root and one or two root canals in the distal root. Distal roots of mandibular first molar have only one root canal in 88.8% cases and two root canals in 28.9% cases as reported by Skidmore and Bjorndal in 1971, whereas Quackenbush in 1986 reported the presence of three separate distal canals in two extracted mandibular first molars. Only a few substantial studies reporting the presence of three distal canals in the mandibular first molar are available. The occurrence of three root canals is reported to be 0.2%–3% in the distal root of mandibular first molar. This case discusses the endodontic management of a mandibular first molar having three distal canals within a single distal root. In this case report, after access cavity preparation, working length was determined using K Files (Mani, Tochigi, Japan) but file in the middle distal canal did not reach the full working length. Therefore, it was inferred that the two distal canals united at the apical third of the distal root, which was further confirmed radiographically. This pattern has been classified as Type XV canal configuration suggested by Sert and Bayirli. The surge in the frequency of reports dealing with aberrant root canal morphology in mandibular first molar further accentuates the need for the clinician to vigilantly observe the pulp chamber floor to detect additional root canal orifices. A conscientious understanding of tooth morphology, angulated radiographs, and detailed examination of the interior of tooth under surgical loupes are vital for a successful endodontic treatment. In addition, other aids such as properly designed access cavity, micro-openers, bubble test, red line test, white line test, use of ultrasonics, and following the rules of symmetry are supplemental in detecting the extra canals. Therefore, careful inspection and use of magnification such as surgical loupes are a prerequisite for the successful outcome of endodontic treatment of mandibular first molar. A thorough knowledge of the several anatomic variations is a prerequisite for careful endodontic management of teeth. Accurate diagnosis plays a vital role in the detection of extra canals. This case report describes the endodontic management of a mandibular first molar with five canals, three in the distal and two in the mesial, in which the distal root showed a Sert and Bayirli Type XV canal configuration. It also highlights the role of the surgical loupes as an objective analytic tool in endodontics, thereby enhancing the overall success of endodontic therapy. Neha, Kansal R, Kharbanda A, Mehta SD, Kriti. 3-D visualisation of a mandibular first molar with three distal root canals using spiral CT and volume rendering technique: A case report. Int J Clin Dent 2013;6:87-95. Kimura Y, Matsumoto K. Mandibular first molar with three distal root canals. Int Endod J 2000;33:468-70. Witherspoon DE, Small JC, Regan JD. Missed canal systems are the most likely basis for endodontic retreatment of molars. Tex Dent J 2013;130:127-39. Fabra H. Unusual anatomy of mandibular first molar. J Endod 1985;11:568-72. Fava LR, Dummer PM. Periapical radiographic techniques during endodontic diagnosis and treatment. Int Endod J 1997;30: 250-61.